Looking for some special music? Check out our exciting new project on the following web-pages. 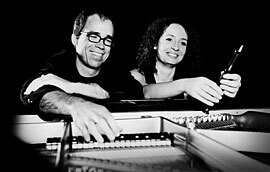 Moderne Klassik - duo innovators, Christina and Michael Schütz, combine and arrange baroque, classical and romantic music styles with pop, rock, funk, jazz, salsa and samba. They fuse rococo period figures with funky rhythms and connect romantic melodies with jazz chords. There is a baroque fugato even in a pop song where Latin American refrains and classical forms meet for a joyful contest. By their creativity and the combination of this unique and attractive sound of recorder and piano, Christina and Michael Schütz have developed their own personal style. In live concerts the numerous facets of sona nova can easily be experienced sometimes by the masterly, sparkling, swinging and sometimes calm, relaxed and contemplative rhythms. Rhythmical groove titles change with meditative ballads with grave parts standing next to cheerful miniatures. Improvisations complete the setting of literature playing with solo pieces expanding the programmatic duet sequence. These two gifted musicians have created a musical, stimulating program, which gives both of them the opportunity to live their pleasure in making music and inspiring audiences from start to finish – which is exactly what they did in the USA, when they performed at one of the world’s most prestigious concert halls, New York’s Carnegie Hall, in February 2007.